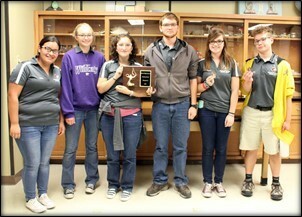 The WCHS Scholars Bowl Team competed in 2 meets this week. The varsity team competed in Beloit on Tuesday, October 24 and took home first place. The meet had 12 teams and began with pool play. The team went undefeated in the pool and continued to be undefeated in the finals to take first place. Results were as follows: 1st: Washington Co., 2nd: Republic Co., 3rd: Southeast of Saline, and 4th: Pike Valley. The team was led by Sophomore Jake Toole, who answered 17 questions in 7 rounds of play, followed closely by Senior Malachi L’Ecuyer with 12 questions. 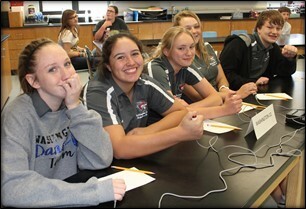 Coach Erin Toole said, “This was a great tournament for us with five team members contributing correct answers throughout the tournament.” Other teams participating were Clifton-Clyde, Concordia, Minneapolis, Sacred Heart, St Johns, Rock Hills, and Russell. Team members were Malachi L’Ecuyer, Hannah Portenier, Malari L’Ecuyer, Jake Toole, Julisa Martinez and Jenae Romeiser. The Junior Varsity team competed in a varsity tournament at Hanover on Monday, October 23. The team placed 8th out of 9 teams and was led by Freshman Addison Mann with 6 correct questions. Toole said, “This tournament was all about getting our JV a chance to experience a varsity meet and for their first time out they did great. We had a goal to score in every match and we accomplished it.” The meet was won by Rock Creek. Other teams participating were Rock Hills, Valley Heights, Frankfort, Marysville, Linn and Hanover. Team members were Brittany Metz, Jenae Romeiser, Mia Cardenas, Garrett Kohlmeyer, and Addison Mann. The varsity will compete again on Monday, October 30th at Valley Heights. The JV’s next meet will be a Freshman/Sophomore meet at Frankfort on November 6.